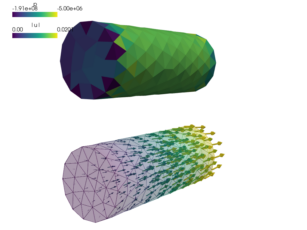 Nearly incompressible linear elasticity in mixed displacement-pressure formulation with comments. \;, \quad \forall q \;. #! (this boundary condition is named PerturbedSurface). #! simple_out.vtk. The material is linear elastic. #! Whole domain 'Omega', left and right ends. #! The linear elastic material model is used. #! Define the integral type Volume/Surface and quadrature rule. #! the 'right' end has non-zero displacements only in the x direction. #! The weak formulation of the linear elastic problem. #! Define linear and nonlinear solver. #! iteration is needed and the final residual is obtained for free.